If one were to step back to Queen Victoria’s day and open the most readily available book around, it would almost certainly be a yellowback. These books, called either yellowbacks or railway novels, were inexpensive, commercial books published in Victorian Britain. These novels had an identifying bright yellow cover that could be read during travel as they were sold at bookstalls in railway stations. 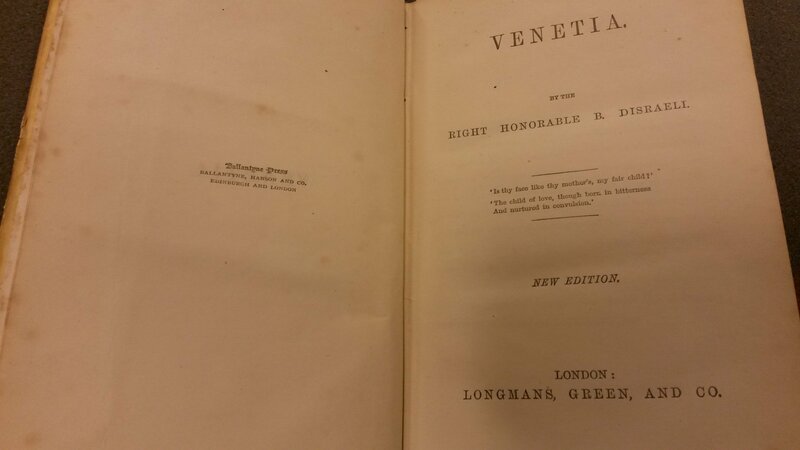 Venetia, published in 1837 and written by the Right Honorable Benjamin Disraeli, was one of these yellowback novels that was distributed throughout Britain. 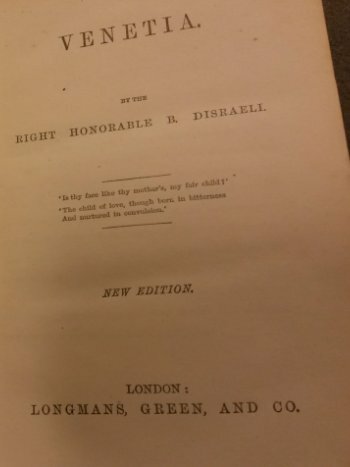 Disraeli himself was a British conservative politician and writer who twice served as Prime Minister, in 1868 and from February 1874 to April 1880. He is still the first Jewish Prime Minister in Britain's history. 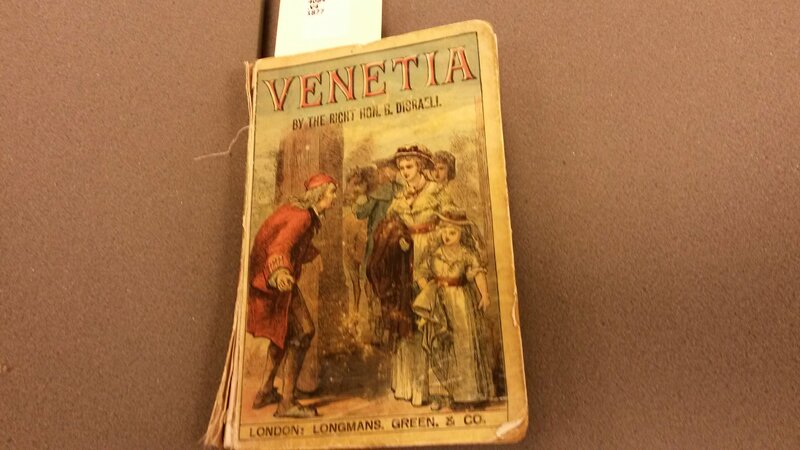 Venetia is one of Disraeli's minor novels. 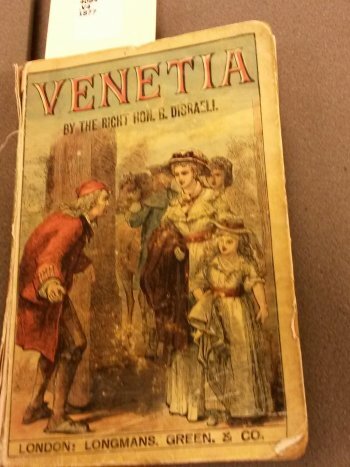 This romance concentrates on a woman named Venetia. 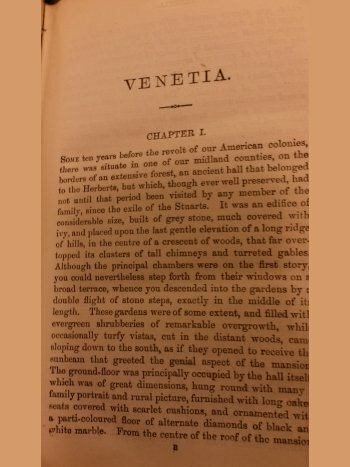 The novel traces the heroine's development from romantic idealist to a practical realist during Industrial Revolution, while engaging the histories of Lord Byron and Percy Shelley. Byron and Shelley were both very influential English Romantic poets. Disraeli's work could be considered a true story, but it is actually a thinly veiled fiction about these two poets. The physical appearance of the book definitely displays its age. 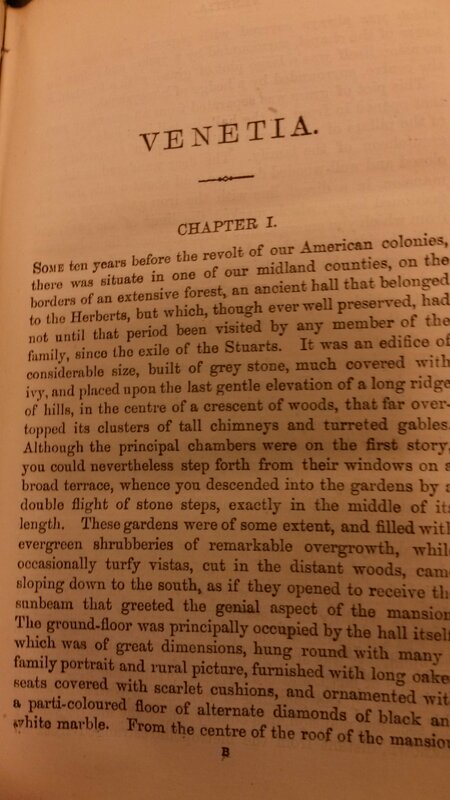 The physical paper is very fragile, however, the legibility of the text is still excellent. Naturally from years of wear and tear, the binding is crumbling and only held together by small strands of fibers. In this era, there were many opportunities to find cheap books ranging from novels to periodicals. These days you could find a book about virtually anything on the shelves of your local bookstore. During the late 19th century, this concept of cheap available books was slowly becoming a reality that grew alongside the literacy of the people.